No matter if one is religious or agnostic, Paul’s letters are compelling pieces of literature. Part confession, part exhortation, and part reprimand, his epistles are a gripping expression of a call to duty in the face of what the Apostle perceived to be an eminent end of days. Although the world did not cease to exist as he expected, the destruction of Jerusalem and its Second Temple eight years after his death in 70 AD, could very well be considered the end of the world for the Jewish people. The political context that led to Paul’s execution in Rome foreshadowed his dread about the future. To this day his landmark epistle to the Romans remains his most important legacy. Overall, his letters disclose a man set apart for a mission. His calling initiated an identity crisis directly related to his Jewish religious background as a man born in Tarsus, living in a Greek cultural environment, and subject to Roman political control. The context of Paul’s vocation reveals a religious disintegration and the unraveling dynamic of a spiritual experience. The term religious typically implies an experience that is lived within the framework of a belief system, whereas the term spiritual relates to an experience that can also occur outside the boundaries of an established religion. Paul’s pharisaic background and calling make his experience both religious and spiritual in the sense that his calling shattered the boundaries of his religious beliefs set by tenets outlined in the Torah. With his vocation, Paul went beyond the instructions to reach into a spiritual realm outside his religious beliefs to embrace what he once perceived to be blasphemous and heresy. Following his calling, Paul undertook to preach the Good News to the world. His travels included cities in Albania, Macedonia, Greece, Cyprus, parts of Turkey, Syria, Asia Minor, Arabia and Judea. On several occasions he visited Jerusalem where several of the Lord’s disciples lived, among them Peter and James, the brother of Jesus. His first journey took place three years after his revelation. On his last visit, approximately fifteen years later, he was arrested, imprisoned and transferred to Rome where he was executed five years later. Paul, the persecutor of Christian Jews, eventually became persecuted by conservative Jews and Christian Jews who did not share his views on the suspension of the law to accommodate Gentile converts. In order to put Paul’s spiritual experience in proper perspective, it is necessary to describe his religious background and the cultural environment in which he lived. It is also important to emphasize the changes brought about by the translation of the Torah into Greek, a language in which Paul wrote his letters. This applies also to all the languages in which the Bible was translated over time. Important aspects of the original Hebrew words have been obscured from one language to another, and inevitably some of the original significance has been lost in the translation. Saul, who is better known by his Latin name Paul, was born in Tarsus –south-central Turkey– between 1 and 5 AD. His birthplace was renowned for being a center of Greek culture. Like many other cities of that region, it was under military and political control of Rome. Nonetheless, Greek was a predominant language of that era. During that period the Jewish population of the Diaspora was approximately 4.5 million, about 7% of the total population of the Roman empire. A majority of Jewish people lived outside Judea, mostly in territories located along the Mediterranean coast of North Africa and the Aegean coast, all the way to Italy and beyond. Paul’s family, like many other Jewish families, lived in voluntary exile, perhaps because Hellenistic rulers had granted Jews extensive rights, special privileges, and protection under the law. At the time of Paul’s writing the literacy level in the Greco-Roman world was close to 20% of the urban population, whereas in Judea it was about 2 to 3% of the Jewish people. Being born and educated in an urban environment with higher literacy levels might explain why his letters were written in Koine, or common Greek. Traditionally, reading and writing were a closely guarded trade by priestly dynasties and scribes of Israel. It was a family craft that was kept from generation to generation. As a rule, priests interpreted and managed the religious instructions of the law, whereas scribes acted as consultants and accountants for the ruling class. In some cases priestly orders also acted as scribes and performed all the related functions for the rulers. Another explanation why Paul wrote in Koine is that the Septuagint, the Greek translation of the Torah, was widely used during his lifetime. According to tradition the Septuagint had its origin in Alexandria, Egypt. It was sponsored by King Ptolemy II (287-47 BC), who had recently established the library of Alexandria. The king was persuaded by his chief librarian to include a copy of the Jewish sacred text in the library. Over time the Septuagint became popular among a growing Jewish population of the Diaspora who were inevitably influenced by Hellenism. This is exemplified by the Epistles and Gospels written in Koine. Paul’s letters are unique in many respects. They are the oldest Christian writings and predate the oldest Gospel of Mark by 20 years. His epistles are among very few documents written by a historical New Testament individual. Although his letters are compelling pieces of literature, they don’t stand up to rhetorical standard. Paul used a dialect similar to one spoken by Hellenistic Jews of the time. His writing reveals he was not concerned with being eloquent. He did not use the canons of rhetoric and did not give credit to reason, the basic philosophical foundation of Hellenism. The text is comprised of different styles crammed together and best described as letters meant to be read aloud by Paul’s emissary to varied assemblies of believers. His composition represented Paul’s own cultural background and his unique way of expressing himself. Not all epistles bearing his name were written by Paul. Scholarly consensus attributes the following documents to his authorship: First and Second Letters to the Corinthians, Galatians, Philippians, Philemon and Romans. Other letters are called Deutero-Pauline, meaning they were written under his name. 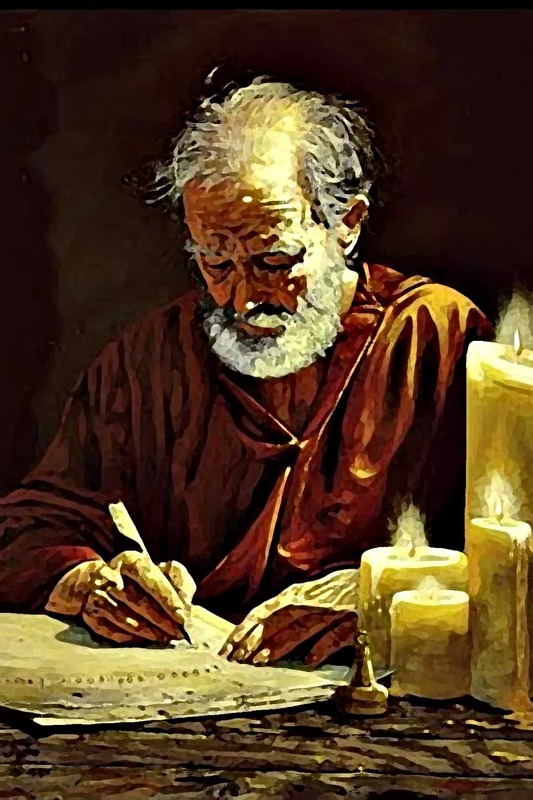 For the sake of authenticity, the list above will be used as the source of this essay, the reason being that it is hard enough to determine an accurate portrait of Paul without having documents that contradict important events or confuse his theological teachings. A case in point is the Book of Acts written by Luke some forty years later. The book is colorful, full of anecdotes, yet in many instances contradicts or omits some historical facts about the apostle. Except for the letter to Philemon addressed to a friend, the epistles are centered on pastoral matters dealing with varied churches that have their location as title. Unlike the Gospels, Paul is not preoccupied with describing the chronological life of Jesus or his sayings. Their content varies from giving thanks, to words of support, to criticism or reprimand, and are mostly concerned with expressing his thoughts on the justification through faith in Christ Jesus. His letters outline his interpretation of the law, sin, love, death and the resurrection of the body of Christ as the Church. The Apostle Paul was a crucial player in the foundation of Christianity. His militant work made him the second most important figure after Jesus Christ. And although he never met Jesus, he did meet Peter, the apostle that the Lord chose as leader of his Church, and James, the brother of Jesus in Jerusalem. As a result, Paul heard first hand their testimony about Jesus’ message. Saul was raised in the matter of the law as a Pharisee. At the outset he was educated in the school of thought that relied on the written and oral traditions of the Torah, a belief system based on the liturgy and rituals that now constitute Rabbinic Judaism. According to his letters, Paul persecuted Jews who were preaching Jesus’ message, and on some occasions he did so violently. He was actively involved in trying to destroy the early church. As a Pharisee he simply perceived Christian Jews as violating Mosaic Law. He persecuted both Jews and Gentiles alike for proclaiming that Jesus was the Messiah and preaching that Jesus was crucified and buried; on the third day was resurrected from the dead and sat at the right hand of God. Christian Jews were also targeted for breaking bread with uncircumcised Gentile converts. The irony is that on several occasions the Gospels describe Jesus being confronted by Pharisees. They claim that Jesus does not have the authority to forgive sins, and that he should not be eating with sinners. He was chastised for healing a follower on a Sabbath. On one occasion Pharisees confronted him by saying that the law of Moses requires that an adulteress be stoned, to which Jesus replies that he who is without sin throw the first stone. One day, on his way to Damascus, presumably in order to persecute Christian Jews, Paul’s religious conviction is shattered to the core. His faith is irrevocably altered. His letters do not give any details of what exactly happened, except that Christ appeared to him in the same fashion as he did to the disciples. All we know is that it brought a radical change in his life. His religious experience compelled Paul into having a diametrically opposed view of Christ Jesus and the Jews and Gentiles who proclaimed his message. What caused Saul’s change? Did he break down, compelled by the message of love thy neighbor made by the people he persecuted? Did he submit to the presence of the body of Christ embodied by Jesus’ followers? Whatever the reason, his experience unleashed a religious disintegration that compelled him to preach the Good News of the resurrected body of Christ. His calling unravels a drastic change in his religious beliefs. The law that once was responsible for the persecution of Christian Jews is lifted. Christians and Gentiles are now to be part of the Church as one body in Christ. With his calling Paul the Pharisee opens his heart to all who have faith in the Lord Jesus Christ. Hence, whoever has faith is saved: men, women, Jews, Gentiles, circumcised and uncircumcised, slaves, free men and members of all nations. There is a significant difference between the original meaning of many Hebrew words, their Greek translation and today’s significance. As a result it is important to clarify some of the concepts as Paul understood them. This is especially the case of faith, sin, death and Christ, etc, that don’t have the same spiritual resonance today as it did when he wrote them. Rom 3: 22 God’s saving justice given through faith in Jesus Christ to all who believe. In a current Christian mindset, faith is a belief that God exists, that we trust that he will do what he says he will do. It also means we trust the tenets of our religious belief system to be true. In this instance, faith places trust in God or on the system we have faith in. The original meaning of the Hebrew word emunah, translated into faith, implies support, in the sense that it does not only rely on the premise that God is present and will act, but emphasizes the individual’s action in support of God and his commandments. As such, faith is an unfailing duty of reciprocity which exists between contracting parties. It is a covenant involving a personal commitment by the faithful and generating a wholesome ̶ shalom ̶ manner of being with the Divine. This support emanates from the believer as much as from God, reflecting a personal relationship with the Lord. The distinction is important in order to understand Paul’s calling of being one in Christ. The Hebrew word grace does not signify elegance and mercy but describes the establishment of a new order of things. It implies a similar sense as the original Hebrew word, meaning the strategic order of setting up a tent in an encampment that separates the members living within with strangers living without. Rom 5:12 When Adam sinned, sin entered the world. Adam’s sin brought death, so death spread to everyone, for everyone sinned. As a consequence of his persecution of Christians, Paul equates the Law with sin and death. The root of sin is not related to sexual behavior but is centered on idolatry that enslaves people by diverting man’s support of God and his commandments. It relates to power schemes that interfere with an individual’s close relationship with God: Popular idols and subliminal gods that are set against the true God. Consequently, the wage of sin is death does not mean the physical decay of the flesh but the estrangement from a close relationship with the Divine. The result is an alienation that shatters an individual’s integrity in respect to who one is, his/her personal calling, and his/her role in history: in Christian terms, salvation. In Genesis, God commanded Adam and Eve not to eat the fruit in the middle of the garden or they would die. The story reveals that Eve listened to the serpent that tempted her by saying that by eating the fruit they would be like gods knowing good and evil and would not die. Adam’s sin stems from listening to Eve and eating the forbidden fruit rather than obeying God’s commandment, an offense that resulted in their expulsion from the Garden of Eden. The transgression initiated an alienation from God’s presence, a loss of Adam’s holiness that introduced sin and a spiritual death into the world. According to Paul, Jesus’ mission on earth redeemed Adam’s sin by restoring God’s presence with his own death and resurrection. Jesus was exalted at the right-hand side of God and restored a divine holiness among all who believe. For Paul, sinfulness is the condition of being devoid of faith in Christ who died to restore a reconciliation with God. Paul uses the same expressions of Lord and God used in the Old Testament. He refers to Jesus as Lord and Christ. The latter is the Latin translation of the Greek Christos meaning messiah. The word Christ does not share the same original significance with the Hebrew mashiach. The term signifies “the anointed one” related to the Jewish practice of the anointing with oil of a king, a sovereign who is a descendant of King David, one who is anticipated to be a great political and military leader of Israel. Mashiach is linguistically, politically, and religiously distinct from the Greek Christos, translated into savior ̶ and more closely related to moshiah. The translation sets the term outside the theological and political jurisdiction of Israel. Saul most likely knew the difference between the two words. However, the scope of his calling demanded that he include Christian Jews and Gentiles who were living outside the political realm of Israel into the body of Christ. There are many instances where God sets apart people in the Bible. We have very few examples of an actual self consecration. Paul is an exception. God sets Saul apart for a mission to reveal his Son in Paul. Rom 1:1 Paul, a servant of Christ Jesus, called to be an apostle and set apart for the gospel of God the gospel he promised before and through his prophets in the Holy Scriptures. There are two separate issues to note from the quotes above. The first: Paul is setting himself apart. The second: the apostle uses a link of Holy Scriptures to justify the unwritten Gospel of Jesus Christ. Paul separates himself and commits his life to Christ. The action of setting apart constitutes a consecration, making someone holy. The separation sets boundaries with the profane, the common and the unclean. It is the action of separation that bestows upon a person or object a quality of being holy or sacred. It is not an intrinsic quality of a person or an object in itself. Paul at the outset believes in the sacred instructions of the Torah. He abides by the exclusive rules of the Holy Scriptures. As a result he opposes Christian Jews who go against God’s commandments. As such he persecuted whoever violated the law whom he considered unclean. Prior to his calling Paul believed in the exclusive rule of the written code consisting of a strict separation between those who abide by the instructions and those who violated them. After his calling, the law is no longer necessary and is associated with sin because it is an obstacle to the message of love thy neighbor that includes Gentiles. The exclusive nature of the Jewish law prior to the Christ event is lifted. It is supplanted by an all-inclusive commandment of love, generating a wholly manner of being that includes Jews, Gentiles, circumcised and uncircumcised, slaves, free men, women and members of all nations: God’s holy people. Rom 13: 8 For to love the other person is to fulfill the law. However, the Jewish law is not abolished. It is encompassed by the commandment of love thy neighbor. If you love your God and neighbor as yourself, you will fulfill law and will not break any of the commandments. As a result, love covers two separate but interacting manners of being consisting of being set apart as a Pharisee, and being one in Christ. It generates an interaction between being exclusively ruled by the written code and by being called into the profane world that was once opposed. It is a movement from an exclusive application of the law to the all inclusive commandment of love. Among all of Paul’s epistles, Romans stand out as his theological testament: It is addressed to Gentile converts he never met, to a church he did not organize, and a city he never set foot in. In the letter he introduces himself and announces his long planned visit to the church in Rome. He informs its members of his project to continue his mission to Spain. He commends Phoebe who will most likely read Paul’s letter to the assembly. He gives thanks to his friends and fellow-workers, among them, Aquila and Priscilla on whom he relied for updates about the congregation. Paul explains that he had to put off his trip on many occasions because of a duty he had to carry out first, the completion of which was a collection of money meant as an offering to the mother church on the occasion of his second visit to Jerusalem. He also confesses that he viewed his journey with some apprehension, concerned that the members of the church would not welcome his visit or accept his offering. He asks the congregation to pray for the success of his mission. The apostle introduces to the Roman assembly basic theological principles of the Holy Scripture, many of which we have outlined. He uses the example of Abraham and God’s covenant to justify his premise that circumcision is preferable but not necessary because Abraham’s justification by faith occurred prior to his circumcision. Abraham’s covenant secured a promise to all descendants and consecrated the Patriarch as the father of many nations not only to those who rely on the law and who are circumcised but to all who have faith. His first of two journeys to Jerusalem proved to be crucial for the unity of the early church, even though Paul did not expect to be welcomed with open arms. Members of the mother church had reasons to view Paul with suspicion, foremost because he used to persecute Jewish converts with notable zeal. Also, the Apostle was considered to be too much of a Hellenist. The Apostle knew his teachings would be questioned by Jesus’ disciples who were more conservative Jewish Christians, particularly James, the brother of Jesus. Among the more contentious issues is Paul’s belief on the suspension of the law to accommodate Gentile converts. Although the members of the mother church believed that the law, including circumcision, should be required of all new Christian converts, the meeting ended with a tacit compromise which allowed Paul’s interpretation of the Gospel to be more tolerant toward the Gentiles. However, after the meeting, both sides stuck to their original beliefs. Paul did not change his mind that the church he was building was God’s new creation in which there are neither Jews nor Gentiles but one body in Christ. Gal. 2:9 For God, who was at work in Peter as an apostle to the circumcised, was also at work in me as an apostle to the Gentiles. Paul’s calling and mission made him many enemies among the Christian Jews as well as the religious Jews who viewed his teachings as a violation of the law. He stood out as a controversial figure and a source of trouble. In 57 AD he was arrested in Jerusalem. He was most likely denounced to the local authorities by religious conservatives during a period when the city was rife with unrest. His arrest took place only a few years prior to the Jewish-Roman wars in 63-73 AD. Coincidentally, like Jesus, Paul’s incursion in Jerusalem would lead to his arrest and death, a convenient scapegoat sacrificed at the altar of political turmoil. Two years after being taken into custody he was transferred to Rome. He was executed under the reign of Emperor Nero in 62 AD. In my essays, The Book of Job, I outline a theory of an interaction between the sacred and the profane. I attempt to show a spiritual dynamic generated by a fuzzy principle defined as the wholly other: a lexical ambiguity that implies solely or exclusively in terms of separate but also signifies completely or entirely as a totality. The dynamic takes place in a sphere in which two distinct entities of the holy and profane interact and transcend each other. The process dissipates any religious boundaries into an all inclusive totality establishing equilibrium between the conflicting outlooks. Keep in mind that the Book of Job is an ancient work of fiction whereas Paul’s calling is a personal account written in his own words. His journey reveals a path from one mode of existence to a wholesome manner of being. It reconciles his Jewish religious background and his Hellenistic cultural environment in which he was born and lived. Paul lives through an experience that moves him from an exclusive reliance on God’s commandments into a profane world of Christ and the Gentiles. In the process he transcends the law’s confinement. He lives through both realities; the Holy Scriptures and his calling to the commandment of love. He moves from one order things to a wholly other way of being. At the outset, Saul as a Pharisee believed in the exclusive application of the law and opposed Christian Jews who did not abide by it. He viewed Christians as unclean, to be chastised. With his encounter with the Christ, his opposition is lifted and he embraces what he once negated. In essence, Paul’s faith lies in a struggle between the law and Christ’s message of love. He overcomes the confines of the written code with the divine power of compassion. His mission henceforth is to preach to all Christian Jews and Gentiles as being part of the holy people. A similar spiritual dynamic is illustrated by Jesus Christ: Jesus the son of man, a title that simply means the profane nature of ordinary human being and the resurrected body of Christ as Lord and sovereign being. Gen. 32:28 Your name shall no more be called Jacob, but Israel, for you have striven with God and with men, and have prevailed. Paul’s calling, like Jacob’s, involves a struggle, one that must be undertaken in order for the dynamic to unfold. It is only after Jacob has striven with God ̶ or his angel ̶ that he became known as Israel. The ensuing battle with the Lord engendered a new religious identity. Like Jacob, Paul struggled with the Gospel and Christ took over. For Paul, love bears all things. He is no longer divided by the demands of the law that led him to segregate both Christian Jews and Gentiles. He reconciles being a Pharisee living in a Greek cultural environment embracing all who have faith in the commandment of love. Rom 13:9 You must love your neighbor as yourself. The meaning of neighbor does not only imply any urban individuals living next to each other. In the context of Paul’s travels to preach, neighbor is whoever one sets up camp next to: men, women, Jews, Gentiles, circumcised and uncircumcised, slaves, free men and members of all nations. 1 Cor 13:13 As it is, these remain: faith, hope and love, the three of them; and the greatest of them is love. Paul’s spiritual journey is referred to as a universal manner of being for the simple reason that the central driving force of his message is love. It is considered to be a principle that is readily accepted as being universal. The term universal has been used instead of the synonym catholic because today it is associated with a religious denomination. It no longer conveys its original significance of katholikos ̶ throughout the whole, or universal ̶ as it was used during the Greek classical period. The term was also popular with the earlier Christian writers who used it in its non-ecclesiastical sense. Love is a powerful force that shakes us and moves us, a drive that helps us see beyond the barriers of prejudice, doctrine and dogma. It opens our hearts to a possibility of making us wholesome by settling internal and external conflicts. Moreover, love unites and reconciles the individual with self, family, friends, community, homeland and the universe. Paul’s words and actions make him an exceptional man not only because of his contribution to religion and civilization. But because his message is universal and immortal, one that reaches out to members of all nations.